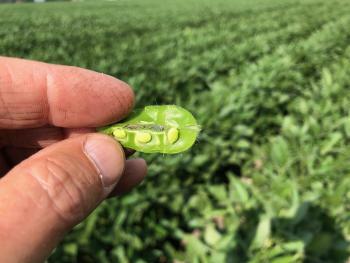 Late season weed escapes, off-target herbicide movement, sightings of soybean aphids, and a little bit of frogeye leaf spot were some of the common issues that Iowa State University Extension and Outreach field agronomists saw in fields across the state this past week. Read on for more information about crop conditions and what’s happening in crop fields across the state. Paul Kassel (Region 2): “Some of our corn and soybean fields continue to look excellent. The early planted corn looks good and is entering the R4 (dough) stage of development. The later planted corn did not withstand the waterlogged conditions of late June as well and does not look as good. In fact, some of the later planted corn has lower leaves that are beginning to fire. The corn acres that received added nitrogen in early July have regained their green color. However, these acres are behind in development and are in various stages of pre-tassel or early tassel stages. Some of the early planted soybean fields look excellent. The mid- May planted soybean fields are in the R5 (beginning seed) stage. Soybean aphid numbers are so far staying at low levels; however, continue to keep scouting for this pest. The treatment threshold for soybean aphids is 250 aphids per plant on 80% of the plants. Alternatively, you can use the "speed scouting" method, which can be found here. There have been a few more reports of dicamba off-target movement. Early planted corn in Clay County at the R4 (dough) stage. Photo by Paul Kassel. Early planted soybeans in Clay County at the R5 beginning seed) stage. Photo by Paul Kassel. 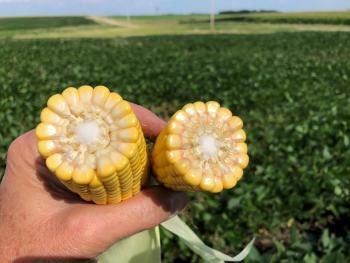 Angie Rieck-Hinz (Region 3): “Corn averages from R2 (blister) to R4 (dough); however, I have even seen a few fields planted mid-April at early R5 (dent). In many places corn is firing pretty high up the stalk—mostly due to lack of nitrogen and now again, lack of water across the southern part of my area. Maintaining stalk quality will be a challenge this year to get us to harvest. Soybeans are R3 (begin pod) to R5 (begin pod fill). I have had a few reports of aphids. I continue to receive phone calls regarding off-target herbicide movement in soybeans. North Central Iowa received less than a half inch of rain for the past week, with the exception of Northwood, which received 0.79 inches. Terry Basol: (Region 4): "The recent weather has provided a nice low stress environment for both the corn and soybeans. According to the Iowa Mesonet, we received about 1.2 inches of rain from July 15 through July 31 at the NE IA Research and Demonstration Farm near Nashua. Corn ranges mainly from the R2 (blister) to R3 (milk) stage with some fields in the southern edge of my region being at R4 (dough). Soybeans range from R3 (begin pod) to R4 (full pod); however, there are some acres in the far northern area of my region that are just in the early reproductive stages (R1 or R2). Overall, there has been low levels of foliar diseases in both corn and soybeans. I've found some gray leaf spot in corn and Septoria brown spot and frogeye leaf spot in soybeans. On the insect side, soybean aphid levels continue to remain very low for NE Iowa, although It’s important to continue scouting as the recent weather that we’ve had is conducive for population increase of this pest. There have been cases of Bt resistant issues in corn fields with corn rootworms that are being investigated. Other insects that have been found in fields include Japanese beetles, Bird Cherry-Oat aphids in corn, and second generation true armyworms." Stress Degree Days for Waterloo from May 1 through July 31, 2018. 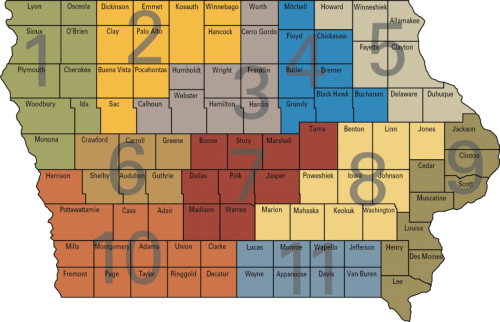 Source: Iowa Mesonet. 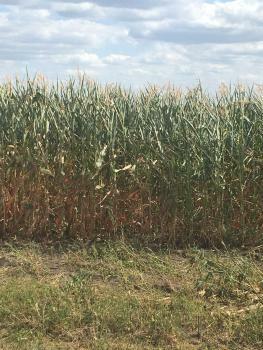 Mike Witt (Region 6): “West Central Iowa received little to no rainfall over the last week. Crops are still doing well, but they could use rain and are starting to show signs of water stress or leaf rolling in lighter soils. If this trend of limited moisture continues and the heat of summer returns there is potential for stress issues. Corn is mainly at the R3 (milk) stage. There is the beginnings of nitrogen stress and firing of leaves in the lower canopy of some fields depending on maturity and nutrient availability. Soybeans are in the R3 (begin pod) to R4 (full pod) stages of pod development with a few fields hitting R5 (begin seed). 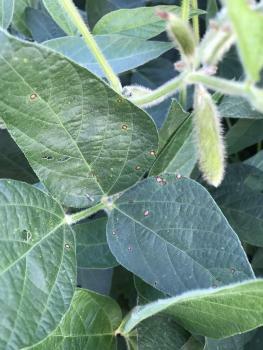 There have been a few reports of soybean aphids around the area. None of the reports or numbers have hit economic thresholds for spraying, but scouting should continue for this pest. Corn rootworm beetles and Japense beetles can also be commonly found in fields. Disease pressures have been limited this year in West Central Iowa with many different diseases present but very few reaching levels that required a fungicide application. It's easy to spot waterhemp and other weeds emerging above the soybean canopy. Take some time now to scout fields for herbicide effectives and for potential weed resistance issues. A trusty hoe is your best bet at this stage of the season for weed control." Early lesions of frogeye leaf spot are small, irregular to circular and gray with reddish-brown borders. As the lesions age, the middle area becomes gray to light brown with dark, red-brown margins. Photo by Rebecca Vittetoe. Despite the cooler temperatures over the past week, the dry conditions continue to persist in southern Iowa, and the drought stress is really showing up in fields. Photo by Josh Michel from a corn field north of Drakesville.